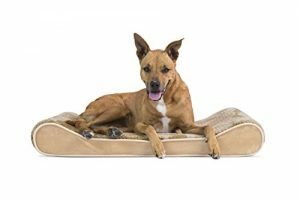 Perfect for pets young and old, the Faux Fleece & Chenille Soft Woven Sofa-Style Memory Foam Pet Bed is designed to provide your loved one with maximum comfort for a good night’s rest. 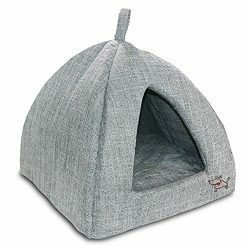 With a warm, soft faux fleece sleeping surface your pet will be more snug than a bug in a rug! 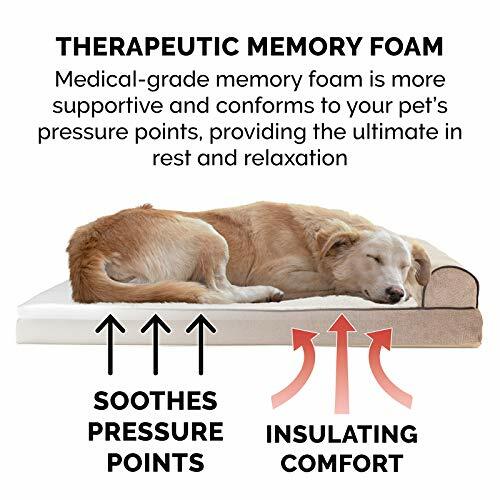 Memory foam is designed to work with your pet’s weight and contour to their body providing better overall support and relief from painful muscles and joint discomfort. 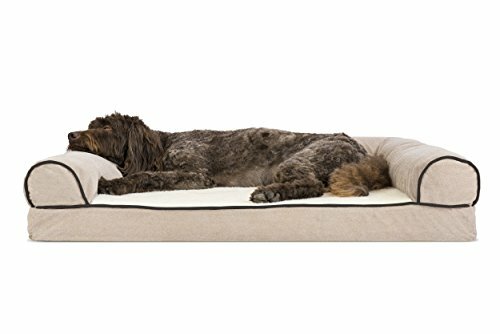 Give your companion the luxury they deserve with this memory top dog bed. 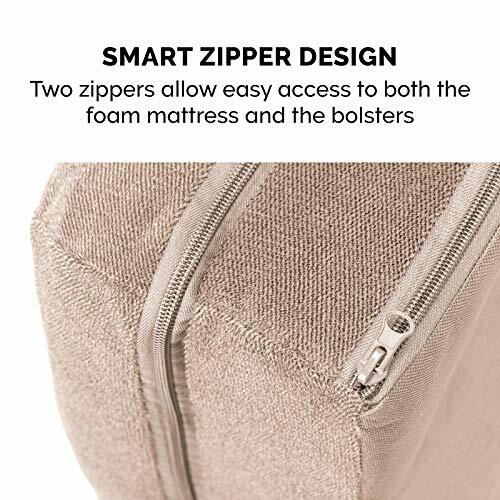 They’ll love the woven chenille bolsters soft but supportive feel provided on three sides giving them a variety of cozy positions to snuggle into. 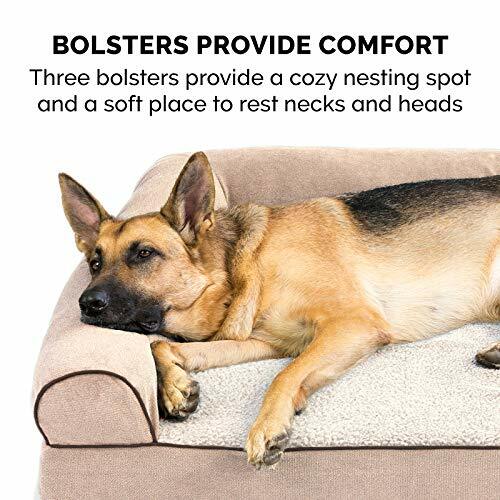 The bolsters are a great pillow for your pet to lie their head on or, for pets that like to cozy into your couch, they can snuggle close to the sides for a sense of security and warmth. Whatever position your pooch likes to lay in, they’ll find nothing but comfort and sweet dreams! 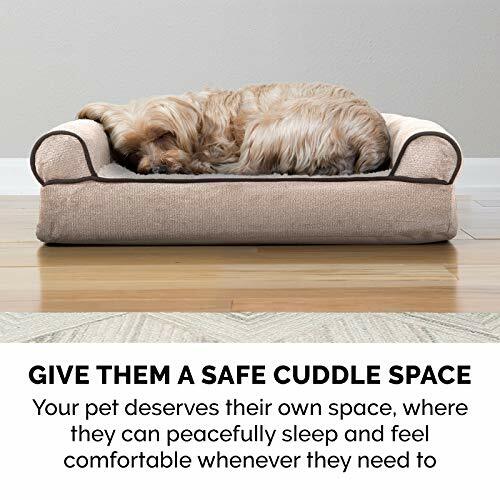 With the feel of a couch, your pet will love having their own space to curl into while you’ll love having your favorite spot on the couch back! No more unwanted pet fur and scratches on your furniture. It’s great for older pets who may be unable to jump on the couch and have had to lie on the floor. 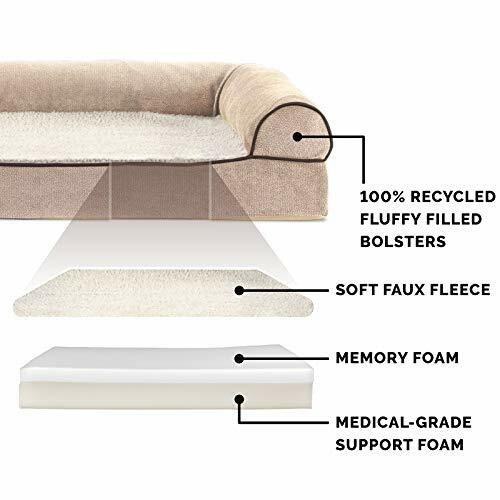 The sofa-style memory top pet bed provides the comfort of a couch without the struggle of getting up there! 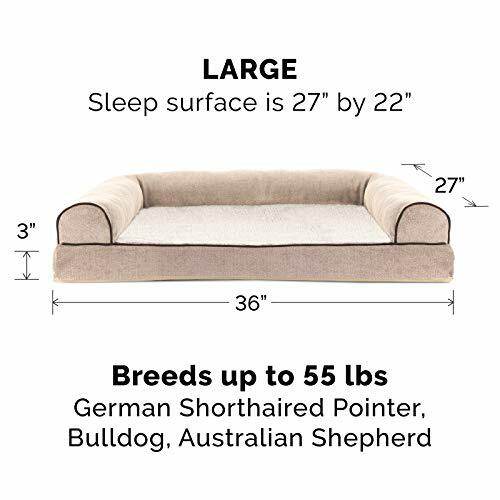 This deluxe sofa pet bed was also made with you in mind and is available in three stylish colors so you’re sure to find the perfect match for your current decor! 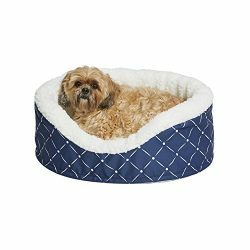 For your pet, we have four sizes so that you can make sure your pet has enough room to fit their preferences for maximum comfort. 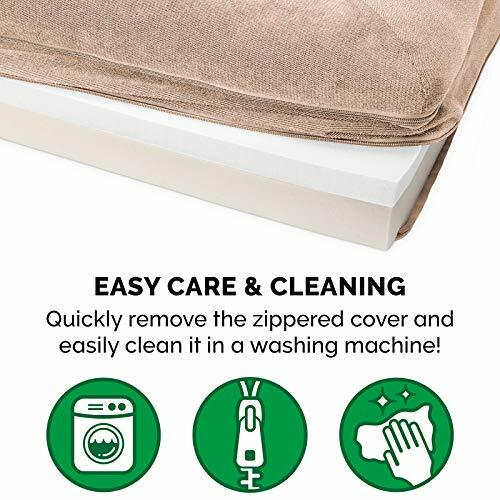 With a removable and washable cover, this sofa bed is easy to clean! 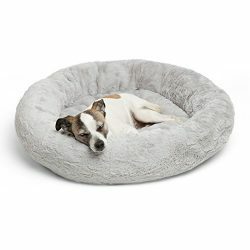 Your pet won’t need to count sheep to fall into a sound asleep on this cozy dog couch!PERFECT FOR CUDDLING: The Furhaven Faux Fleece & Chenille Sofa pet bed features a three-bolster design that gives your pup the flexibility to doze in a variety of positions. Invitingly cozy in form and function, the bed offers plenty of headrest space for high-loft comfort, as well as open corners for nestlers to burrow into. Your dog is going to love curling up and cuddling into this bed! 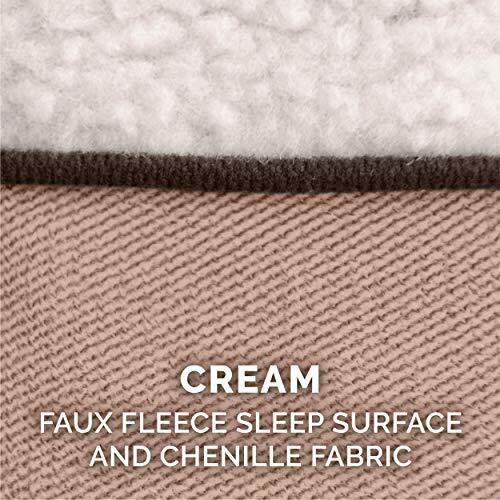 SNUGGLY SLEEP SURFACE: The cuddly faux fleece fabric that lines the sleep surface is gentle on noses and paws, providing optimum nuzzling comfort and cozy snuggles for your favorite pooch. 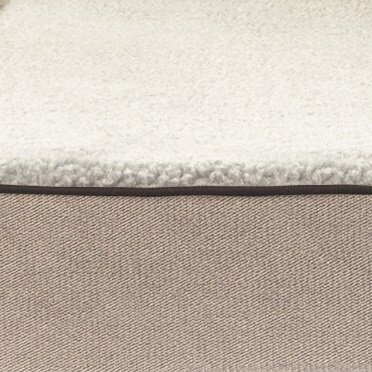 The matching chenille bolsters and gusseted base offer additional surfaces your furry cuddler can nestle up against. 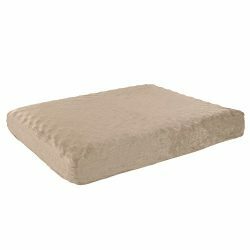 EASY ON JOINTS: The memory foam top works with your pet’s weight and contours to their unique shape to provide better overall therapeutic support for joint and muscle discomfort, with the 100% recycled fluffy fill railings offering additional orthopedic aid for the neck and spine. 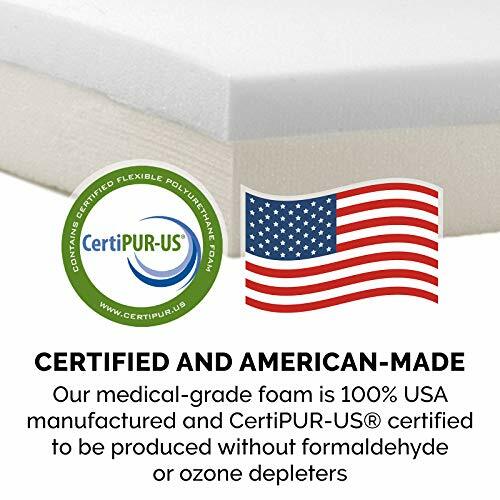 The three-bolster design makes the bed accessible for elderly and disabled pets. AVAILABLE SIZES & COLORS: The Furhaven Faux Fleece & Chenille Sofa comes in three different colors: Coffe, Cream, and Orion Blue. 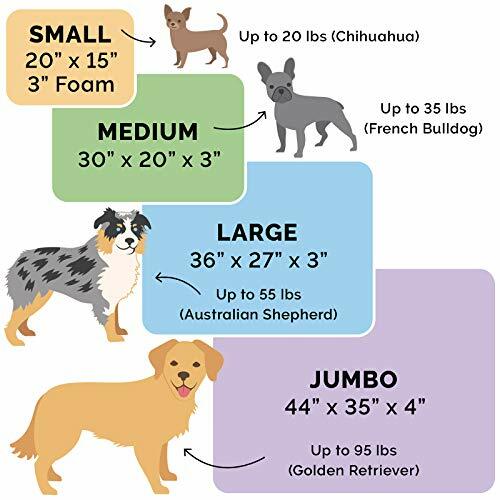 It’s also available in the following sizes and dimensions: small (20″ x 15″ x 6″), medium (30″ x 20″ x 7″), large (36″ x 27″ x 8″), and jumbo (44″ x 35″ x 10″). Find the right one for your pet! EASILY CLEANUP AFTER PETS: We at Furhaven know that pets can present some unique cleaning challenges. That’s why we’ve made the sofa bed cover machine washable! Simply remove bolsters and filled liner (foam core or fiber), zip cover close, machine wash separately in cold water – do not bleach! – then line dry or tumble dry low. Core and bolster liners are not washable.